Due to my nature of a hoarder, I have over the years, collected a number of these plastic tubs. I knew [ahem] they would come in handy one day. So when I needed to sort my beads in various colours and types, I found these sauce tubs really useful. 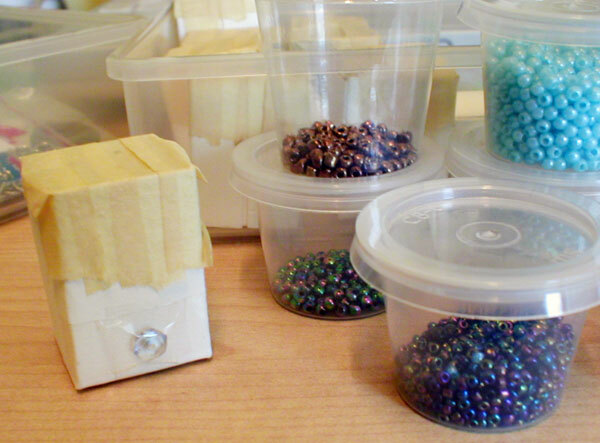 I can see the size and colour of the beads, and I can stack them neatly in my craft drawers. When I ran out of the tubs, I simply cut some of my old packaging boxes (from supplements, cream, etc) to make small boxes. I then tape the top off with masking tape to secure the beads. Since these are not transparent, I took one of the beads to stick it outside the box to mark the type of beads in each box. I did this when I had to move away and had no choice but to store the beads away for a long time. Now that I can finally get my beading projects going again, I don't have to open every single box to see what's inside before I can decide on which beads to use.